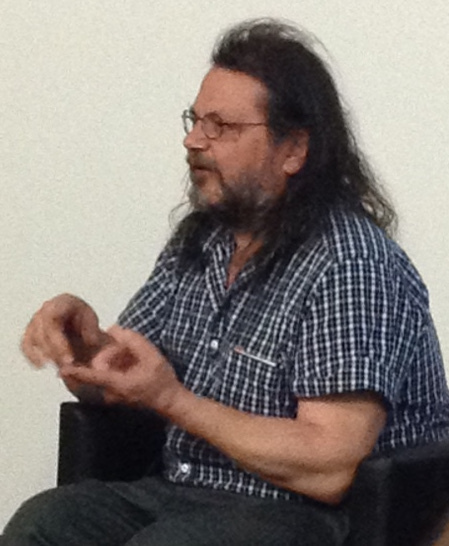 Max Schumann, the Acting Executive Director of Printed Matter, Inc, gave a public talk at Artspace on Wednesday 6th May. Printed Matter is the world’s leading non-profit making organisation dedicated to the dissemination, understanding and appreciation of artists’ books. 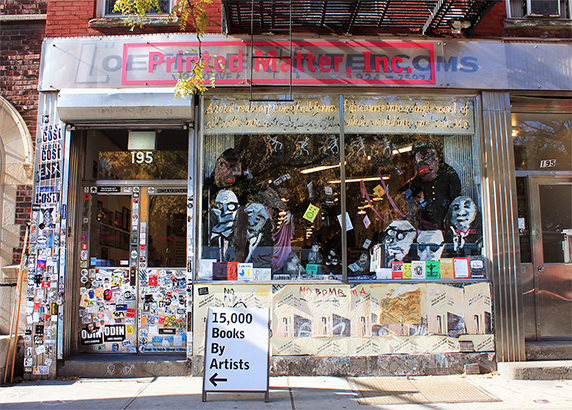 Based in New York they maintain an expansive inventory of 15,000 titles by over 6,000 artists as well as maintaining a busy programming calendar which includes exhibitions of contemporary and historically significant artists books, artist talks, book launches and performances. https://printedmatter.org/. Anna Couani was in the audience. Schumann has been visiting Australia to speak at the recent Artist Book Fair at the National Gallery of Victoria and at a number of other engagements. His talk at Artspace was attended by artists, writers and academics and was as interesting during the discussion time as during the talk. Max Schumann who is also an artist who makes books, mostly recounted and explained the history of Printed Matter Inc, the bookshop where he works in New York City. It is an organization that started in 1976, was a hub for a number of now-famous experimental and avant-garde artists and theorists, and is still surviving today. For that reason, it has become an icon in the US art world. MS talked about people like Lucy Lippard, Sol LeWitt, Richard Prince and Barbara Kruger, just a few of the names he mentioned of people who are famous today. However, he also showed a number of titles and stressed that there are many people who’ve produced amazing work that is under-acknowledged. He also recounted a number of entertaining stories and events, referring to times when the bookshop/ organization almost became defunct because of financial difficulties. They had started out trying to run a profit-making business but eventually realized that they couldn’t achieve the kind of turnover of regular bookshops and that this was just the wrong business model for their enterprise. So they survived by becoming a not-for-profit business and this enabled them to tap into the tax concessions that are offered in the US for that kind of initiative. However, they still have to rely on sales of artist books to survive and do so even with a staff of 10 people. State funding is sparser in the US than in Australia. The storeroom of the business must be worth quite a lot financially these days and Max recounted a hair-raising incident when their storeroom was flooded during Hurricane Sandy. They were able to get all the stock to a facility that freeze-dried it and managed to salvage everything. Their stock consists of audio cassette tapes, VHS tapes and DVD’s in addition to paper-based work. The daily workings of the bookshop from early times till today are fascinating. As well as stocking books, selling them in the shop and mailing them all around the world, they have regular surveys that are exhibitions of particular people’s art books or movements. They have done surveys of collaborations between practitioners from different fields eg Thurston Moore from the band Sonic Youth and Yoko Ono. Since early times, they have utilised the shop windows for installations by artists and curators. In discussion time, Anna Gibbs, an academic from UWS, writer and literary editor whose current research is on ‘The Power of the Image’ raised the issue of distinctions between artist books and small press writers’ books that might also be hand made and also have the aim of reaching an audience without having to run the gauntlet of all the mainstream gatekeepers. Schumann had shown slides of lots of conceptual artist books that consisted entirely of text. There are fuzzy boundaries around a number of art practices and the classification of art practitioners and it is difficult to figure out sometimes why these boundaries are drawn and where exactly they are. This is not specific to Printed Matter but raises interesting questions that are relevant in Australia as well. Melbourne publisher Black Inc is one publisher that publishes work by practitioners across different fields and they were represented at the Melbourne Artist Book Fair this year at the NGV. One of the most positive aspects of Schumann’s talk was the extent to which he showed how Printed Matter allied itself with and supported socially and politically oriented work like Occupy Wall Street, Guerrilla Action Group and Guerrilla Girls. The kind of inclusiveness operating in the Printed Matter bookshop was impressive, the work of unknown artists exists alongside famous ones, and feminist artists and movements have been fully embraced. This entry was posted in Anna Couani, Artspace, Max Schumann and tagged Anna Gibbs, Art Books, Barbara Kruger, Lucy Lippard, Printed Matter Inc., Richard Prince, Sol LeWitt, Sonic Youth, Thurston Moore, Yoko Ono. by Mark Roberts. Bookmark the permalink.